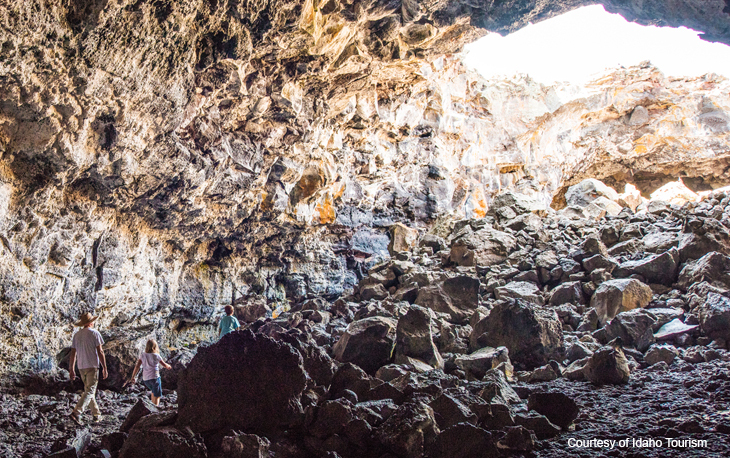 "Craters"—as it's known locally—is wildly different from anything else in Idaho. Located on desert foothills outside Arco and formed by lava flows over the past 15,000 years, Craters of the Moon is at once eerie and awe inspiring. The area sees very hot days during the summer but is an excellent destination in the cool autumn. At sunset, when the breeze blows and the evening light hits the black, red, and brown rock landscape, you'll feel like you're on another planet. There’s excellent hiking in the park, with trails ranging in length from 0.1 to 8 miles. Many of the trails are very well-groomed and easy to walk, and there are five different caves to explore (as long as you get a permit first). While there, you’re likely to see wildlife ranging from bats and jackrabbits to antelope and mule deer. The trails are very safe, but never allow children to wander off the trail—deep holes have been formed by the hardened lava. In the winter months, the park offers snowshoeing and cross-country skiing on well-groomed tracks. Want to learn more about IDeal and how we can help your family enjoy today while preparing for tomorrow? Sign up here. If you want to learn even more about Idaho’s kid-friendly outdoor spots, check out 18 Summers, a website created by Visit Idaho.